It doesn't matter if you were in school — or even alive — when the 80s revolution unleashed its musical fury. Either way, you've felt its impact, courtesy of life-changing songs that defined an entire generation, songs that still pack one hell of a punch nearly a quarter-century down the line. So for our first 80s Dance Party we're gonna play them all! Anthems from songbirds like Cyndi Lauper and Whitney Houston to arena-rock favorites from Queen and Bon Jovi, oh and don't forget the synth-pop icons like A-ha and Thompson Twins. Pulling the music together is what we (and Peter G) do best! 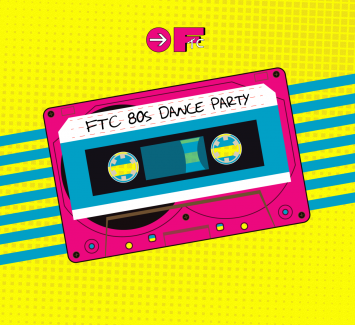 So whether you're there to relive your glory days or just 80s curious, with our Dance Party you can enjoy the best of a decade in one time-warping wonder of a night, all while supporting FTC. Don't forget the spandex and acid washed jeans - festive attire is encouraged!